A couple of weeks ago, you may recall that I wrote about a stump in my backyard. To make a long story short, my stump was unrightfully removed, and so I complained and got it back. The workmen put my stump on the other side of the yard, so I had to move it back to the spot where I wanted it. My stump is a heavy piece of wood, and as I tried rolling it across the yard, I spotted a bright, shiny green bug. You know me…I always jump to the worst conclusion. Remember the whole “poison ivy” episode? So of course, I started worrying that this bug was the Emerald ash borer, which in an invasive insect and are supposed to be reported if you spot one. This time, though, I was more rational. The stump was from a maple tree, not an ash, and it was not a live tree. But I had to figure out what kind of bug has such a shiny green color! I just love this insect identification website. It showed me the insect I saw right away…it was the Augochora Sweat Bee. Who knew a bee could be green? I wrestled the stump to where I wanted it to be. The next day, Emmy and I happened to catch the end of Sid the Science Kid on PBS. The episode was all about a stump in Sid’s backyard — Sid decided to Save the Stump. What a coincidence! After we had lunch, Emmy and I went to the backyard with potting soil and a magnifying glass. 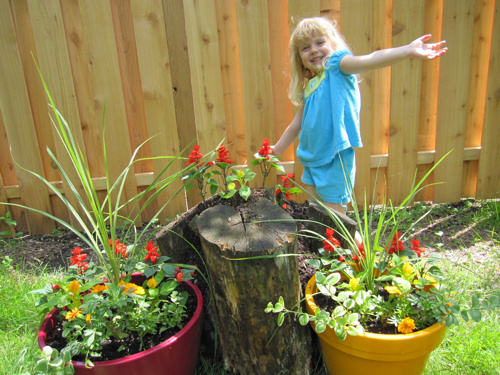 We looked for bugs and planted some flowers. P.S. It’s here! This weekend, June 4-5, I’ll be walking 39 miles in the Avon Walk for Breast Cancer. I’ll be tweeting about the walk on twitter: @lemondroppie. Come back next week to see if I made it! I've never heard of anyone saving a stump! But I like it. It looks perfect surrounded by your flower pots.And I think you'll definitely make it!